bowhunting pigeons is not for the faint of heart. The shots are tough and the birds move incredibly fast. Pigeons are a favorite food of many avian predators, and Tim Wells is no exception. Tim likes to shoot, and when you put yourself in the right place at the right time, shooting you will do when bowhunting pigeons. 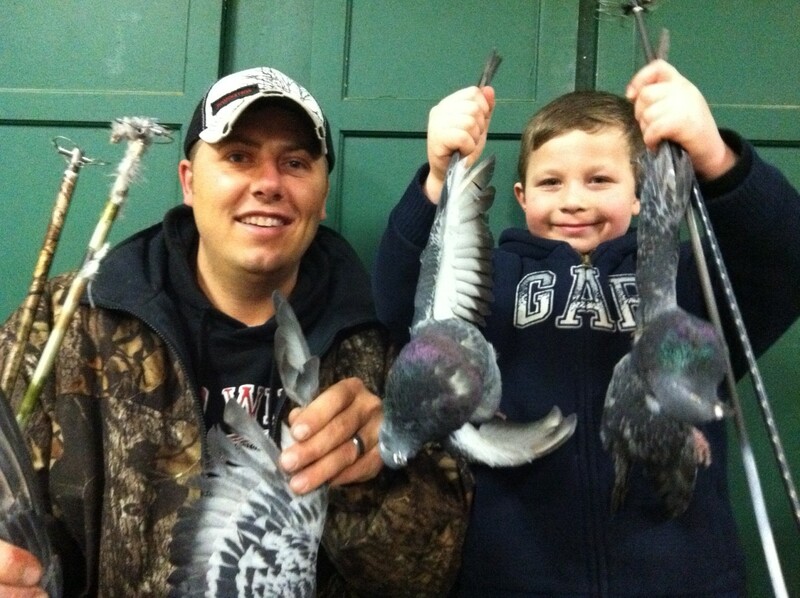 Hunting pigeons is similar to bowhuntingdoves, so we can pull a few pages from that book. Let’s break down what we need for bowhunting pigeons. Your shoot to kill rate is going to be very low when bowhunting pigeons, so sewt yourself up for multiple shots. The best way to do this is to set up where the birds want to be, and give yourself multiple options. Finding where they roost, feed and water is the key. Just seeing a flock winging around will do you no good. You must find where they want to put their feet down to be successful bowhunting pigeons. Pigeons like to feed at first light, and then again in the early evening hours. Scout for the birds in the fields, and on water during these times to set up in spots conducive to bowhunting pigeons. Pigeons are like any other wild animal, and while they will tolerate the presence of humans they are familiar with, they will avoid confrontation with the bowhunting archer. You will get a couple shots at most bunches, and then it’s time to relocate and let them cool down for 5 or so days. Get your self a milk run of spots to hit quick and hard, and then move on to the next. Keep your spots fresh so they decoy in for close fast shooting. You need full camo, at least a dozen decoys, and Snaro bird points. 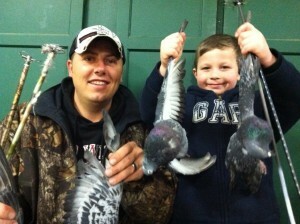 I prefer the 6 inch models on pigeon sized game as it will do the job from a 50 pound recurve and any size compound. The Snaro bird point will shrink your groups 6 inches in one shot (pure physics) and help you bring down those flyers without ever losing an arrow. It’s the closest you can get to firing a shotgun when you are bowhunting pigeons.